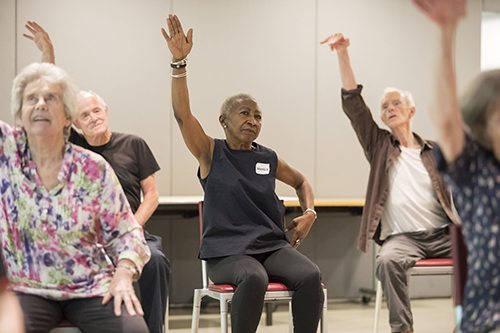 Monica Duck is a member of Company of Elders , the Sadler’s Wells over-60s performance company, which has been proving since 1989 that it’s never too late to start dancing. Company of Elders will be performing as part of Elixir festival this weekend. We speak to Monica about learning choreography and taking to the stage as an older dancer. I started dancing a year ago. I am fitter, have more energy and have learned about group dancing. I will be performing at Elixir Festival as part of Company of Elders. The piece is called here created by Shobana Jeyasingh. It’s a combination of stories drawn from the group participants that were adapted during rehearsals. When I first started learning choreography I found it difficult to remember. Now I feel freer to dance and move. My rituals to keep my body moving start at home I run up and down the stairs with music and I wear a FitBit, with an aim to do 10,000 steps a day. My top three tips for someone looking to start dancing as an older adult is to remember you’re never to old to start dancing, to have fun and watch dance classes on YouTube to gain confidence.